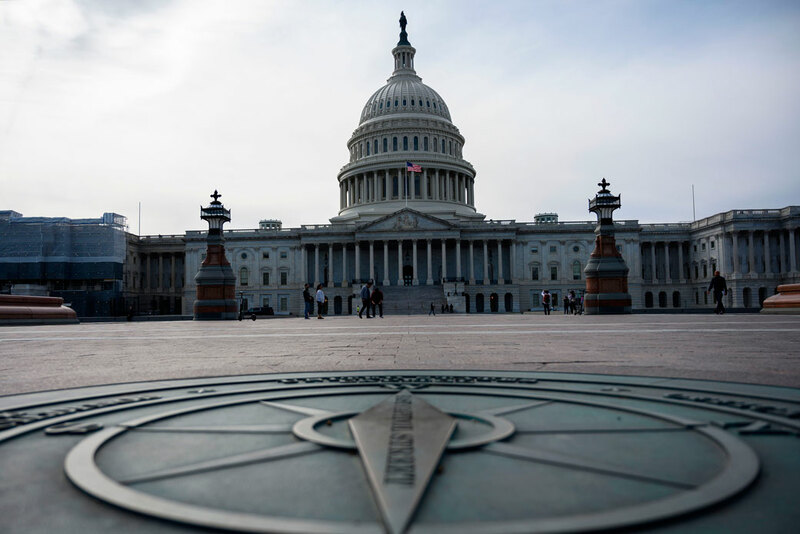 The U.S. Capitol is seen in Washington, D.C., March 2019. The U.S. economy finds itself at a crossroads of overlapping challenges. Long-term productivity and economic growth are low, while income and wealth inequality are high. Meanwhile, the country faces a series of challenges: from collapsing economic security for middle- and working-class Americans to climate change and more.1 Addressing these challenges will undoubtedly require the deployment of significant federal resources since the private sector has failed to do so. The good news is that the economic evidence suggests there is indeed room for the government to address the country’s current challenges. And the economic research shows ways this can be accomplished by using spending and tax policy more effectively than how it has been used in the past. The content of those investments is crucial: smart investments that boost competitiveness and secure economic stability for working families will yield returns, while wasteful tax cuts will create massive, long-term deficits without clear, tangible benefits. In short, America still can do big things—and it can do those more effectively than it has in the past. Each dollar spent on smarter, more effective government programs and tax policy will then go a lot further in boosting the economy and strengthening a struggling middle class. To be clear, the deficit-busting 2017 tax cuts show that policymakers fighting for working families should not fall for letting the debt and deficit be used as a heads-I-win-tails-you-lose political trick deployed against only working families’ economic priorities. But the tax cuts also revealed the depth of their own flawed approach to debt. Yes, policymakers still need to take seriously how to budget for economically appropriate and sustainable levels of debt and deficits. But a large economic literature shows that debt incurred in a smarter way translates into faster growth, which, in turn, makes repaying that debt far easier than the wasteful, inefficient, and ineffective supply-side tax cuts that have dominated fiscal policy of the past two decades. With such a smarter approach, guided by economic evidence, policymakers will be able to confidently say that America can build an economy that works for all, while also meeting its financial obligations for the future. Different choices on spending and taxes than those made in the past can substantially increase the chances for faster growth and less inequality. The evidence shows that a country’s ability to manage deficits and debt are greater when the money is spent on things that will reliably and sustainably boost economic growth, such as more infrastructure spending, education, and social insurance to reduce inequality. Current debt levels largely reflect wasted resources in the past and, to that extent, pose drag on the economy, because tax cuts in recent decades predictably did not translate into faster growth and higher wages. In fact, long-term growth did not accelerate while income inequality remained high because of the tax cuts. Existing debt levels simply as a stand-alone matter pose manageable challenges. The government has the room to increase spending and reform taxes while putting a lower priority on deficit reduction, provided those investments are made in the smart way outlined herein. The bottom line is that addressing this country’s national challenges today and securing its fiscal future tomorrow can be done through a coordinated approach to spending, tax revenue, and borrowing that ensures a more competitive, inclusive economy in the most expedient and effective way possible. The economic research, summarized in this report, shows how this is doable. Public debt is not inherently bad. In fact, it can be quite useful, depending on for what purposes the money was used. It allows the federal government to make immediate investments that yield benefits now and in the future, when done efficiently, focusing on measures that have been shown to boost growth and reduce inequality. Debt has enabled the United States to achieve victory in both World War II and the Cold War, build a modern infrastructure, produce groundbreaking innovations, recover from economic crises, and more. Indeed, maintaining a reasonable level of federal debt is actually economically essential for both the U.S. and the global economy. U.S. debt forms the foundation of the U.S. financial system, serving as collateral and liquidity for a wide range of financial markets and institutions. Worldwide, assets are priced in relation to U.S. debt. The question is not whether the United States should have debt—instead, it is how much. The key measure that economists consider in answering that question is the ratio of debt to gross domestic product (GDP). There is undoubtedly a level of debt to GDP that is too high for any country. If a country reaches that point, it could face a financial crisis, whereby investors lose confidence in a government’s ability to repay its debt. The result would be quickly rising interest rates as money flees an economy, falling exchange rates, slowing economic growth, and possibly a deep recession with sharp increases in unemployment. But with a wealthy and largely productive economy, a stable rule of law, and efficient tax collection mechanisms, the United States remains extraordinarily creditworthy.2 Certain factors, moreover, make this additionally true, such as the U.S. dollar currently being the leading global reserve currency, whereby other countries want to invest their savings in U.S. dollars as a safe haven from all kinds of economic and political risks. The U.S. government also has independent control over its currency, which lowers the risk of sharp interest rate increases due to changes outside of the United States. This is not always the case for other countries, including the eurozone—the European countries that share the euro as their common currency. But even for the United States, debt beyond a certain level could create challenges that deserve serious consideration and appropriate management. 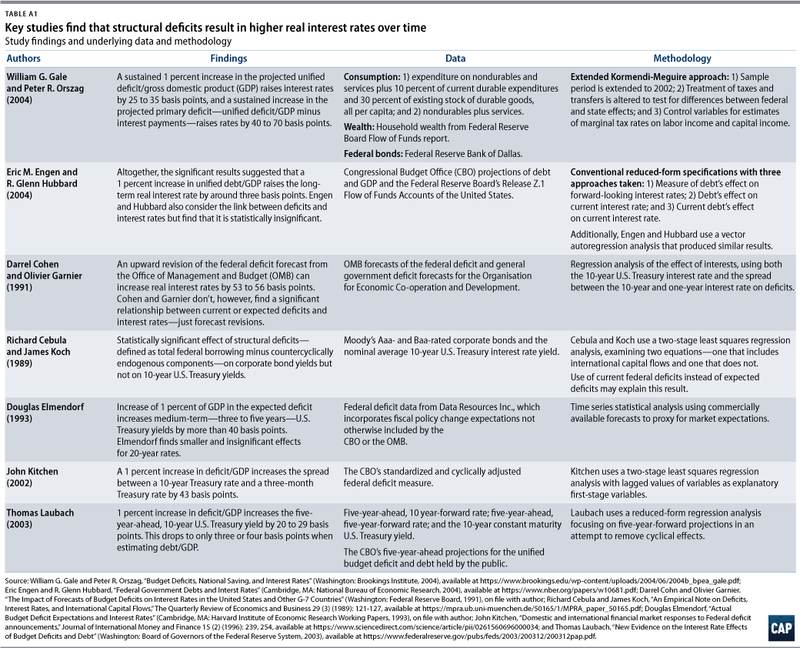 Given that the United States is still far away from debt levels where such risks would begin to materialize, as the summary discussion below shows, the key question is how deficits could grow such that debt levels become a burden—as the discussion on debt crises further below shows—rather than a useful way of financing today’s social needs. First laying out how and why debt to GDP can increase, stay the same, or even fall, will provide a useful organization for the rest of this report. The following sections then discuss the existing evidence on the potential causal relationships among the key variables. Specifically, this report looks at how deficits influence interest rates, economic growth, and inflation. A more thorough understanding on the causal relationships between these variables will permit a consideration of future trends in the debt-to-GDP ratio. If the underlying causes of deficits such as tax cuts or spending increases result in faster growth without offsetting increases in interest rates, the debt-to-GDP ratio may grow more slowly or even fall. Alternatively, if deficits, caused by past policy choices, do not translate into faster growth, the debt-to-GDP ratio will increase. Today’s debt is the accumulation of past government deficits. As noted, there may be good reasons to run deficits, but government deficits are not entirely like that of a business or family, as the government has a special role to play in the macroeconomic cycle. Deficits often arise in the context of slow economic growth or recessions. It is important, though, to distinguish here between cyclical and structural deficits. A budget deficit may widen as the economy turns into a recession. Tax revenues fall, and spending on social programs and other activities increases. Some of this is automatic due to the progressivity of income taxes, for instance, and the social insurance nature of many spending programs such as the Supplemental Nutrition Assistance Program, Social Security, and unemployment insurance. In addition, some part of the cyclically widening deficit may follow from legislative decisions to temporarily stimulate the economy with tax cuts and spending increases. Either way, cyclical deficits may lead to a more stable economy than would be the case if governments actively engaged in policies to keep deficits from rising or even tried to reduce deficits in the middle of a recession—a process commonly known as austerity. Structural deficits follow from longer-term policy decisions that are often, albeit not always, intended to boost longer-term, or trend, economic growth. Congress may decide to cut taxes, especially corporate taxes and higher-income earners’ personal taxes, to lower the costs of capital for businesses. In widely discredited supply-side theory—also often referred to as trickle-down economics—this should result in more investments and faster economic growth. Alternatively, Congress may decide to spend more on increasing the country’s infrastructure, invest more in education, and raise benefits in social programs. Better infrastructure should reduce business costs as firms presumably can get their goods to market in a faster and more reliable way. Higher-quality education should increase the skills and thus the productivity of workers. And finally, higher benefits in social programs could lower poverty and income inequality as well as improve children’s future prospects. Less income inequality means that lower-income and middle-income families may see faster income growth than otherwise would have been the case. They can both spend more and save more money or, alternatively, incur less debt. The resulting economic security for many families could create pathways to more upward mobility and investments in commodities such as housing, startup businesses, and children’s education—all of which could have positive effects on economic growth over time. A number of different schools of thought exist that link fiscal policy with long-term economic growth, especially in the current context of modest economic growth, slow business investment gains, persistent underemployment, and very high income inequality. Many of these favor more government spending—especially to boost infrastructure spending and reduce income inequality, for example—through larger social insurance programs, as the evidence in this paper discusses. The evidence on the effectiveness of fiscal policy to boost long-term economic growth gained more attention from economists of all stripes amid the modest economic growth following the Great Recession. Some economists argued that the United States was stuck with unsatisfactorily slow growth due to structural problems.4 The need for additional government spending to strengthen the economy may then be especially important when structural problems such as massive inequality and financial bubbles hold back the economy from growing more quickly. Importantly, monetary policy, the other macroeconomic policy lever to increase economic activity, may not work because interest rates are already near zero percent. Under those circumstances, more public spending may have to offset the lack of private activity. Several structural problems, such as low investment spending and high income inequality—and, thus, limited demand that hampered economic growth immediately after the Great Recession—continue, while others, such as tight credit after the bursting credit bubble, have diminished. The evidence reviewed in this report suggests that more public spending on infrastructure, education, and measures to reduce income inequality can boost economic growth. Debt relative to the size of the economy may even shrink in this case, as economic growth outpaces debt growth from new deficits and interest rates. The economic evidence discussed in this paper shows that more public spending on infrastructure, education, and measures to reduce income inequality is a much more effective and more efficient way of using government resources than cutting taxes for high-income individuals and corporations. It then also follows that a more effective fiscal policy will make it easier for governments to manage any associated deficits and public debt. In fact, the data indicate that effective investments, even when financed with deficits, could potentially result in less debt relative to the size of the economy because of faster economic growth that outpaces increases in debt. Whether cyclical deficits increase automatically due to the progressive features of taxes and spending, so-called automatic stabilizers, or whether they result from discretionary policy responses to an economic downturn, they will counteract recessions and quicken economic recovery. Some economists, such as Alberto Alesina and Silvia Ardagna, though, argue against using spending increases and tax cuts to help a weak economy. They assert that governments that have shrunk their deficits mainly by cutting spending and maintaining tax rates will ultimately be in a better position to grow again.7 Under this expansionary austerity theory, smaller deficits make consumers and businesses feel more confident about the future of their economies, thus they spend and invest more than they otherwise would. Those effects outweigh the contractive effects of cutting government programs or increasing the government’s revenue take. This argument has occasionally been used to support cutting deficits or, at least, not expanding them to boost economic growth when it is weak. In fact, a number of politicians seized on the expansionary austerity theory and argued for more spending cuts immediately following the Great Recession.8 The underlying data used to support this viewpoint, however, rely on findings from just a few Organization for Economic Cooperation and Development (OECD) countries that were near or at full employment—far away from an actual recession.9 Moreover, the research did not distinguish between planned fiscal policy measures and changes brought on by automatic stabilizers. Considering the entirety of the evidence on budget deficit reductions via spending cuts indicates that these cuts indeed tend to lower economic growth, presumably harming an economy when it is in a recession or a phase of weak growth.10 Thus, the evidence does not support the notion of expansionary austerity. 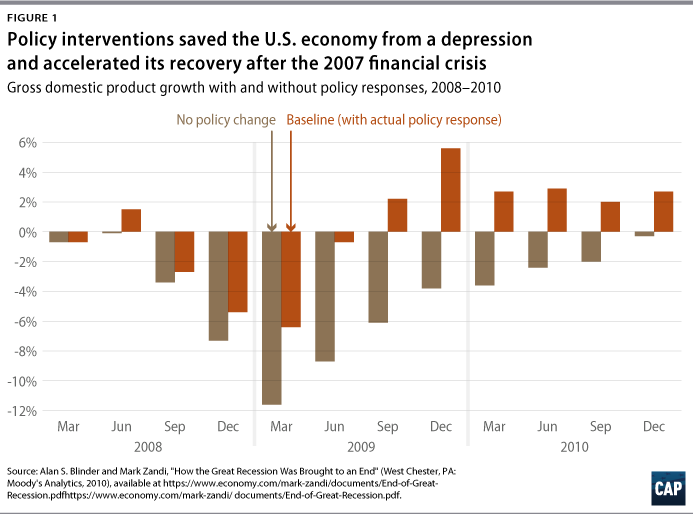 A large fiscal policy intervention to combat the Great Recession was especially warranted since the other policy lever—lowering interest rates—was ultimately limited when interest rates effectively fell to zero. Bradford DeLong and Lawrence Summers argued that deficit-financed government spending amid very low interest rates and high unemployment could ultimately reduce the debt-to-GDP ratio—not only in a cyclical downturn, but also in an environment where the economy grows very slowly.13 In a recession, the economy would grow faster than otherwise would be the case due to the additional government spending that fills in the gap left by the lack of private investment and consumer spending. By definition, there is a lot of room to grow in a recession, illustrated, for instance, by low investment and high unemployment. Debt growth, on the other hand, is limited due to low interest rates when the government runs a deficit. To be clear, this research also implies that fiscal inaction comes with a substantial cost. People will lose out on jobs and wage gains that would allow them to pay their bills and save for their future when the government decides that austerity and debt reduction should take precedent over investing in the economy and its people amid underemployment, massive inequality, and modest growth. More economic stability can then translate into more long-term economic growth. Economic research has shown that countries that have smaller swings in economic growth over time tend to also grow more quickly over the long term.17 One key mechanism that is likely at work here is that smaller and less frequent economic swings make it easier for businesses to plan for the future and thus to invest in longer-term projects.18 More productive investments following more economic stability will ultimately translate into faster long-term economic growth. However, higher interest rates could offset the positive benefits from wider cyclical deficits. They could emerge due to two factors. First, fiscal stimulus would increase the demand for goods and services in an economy. If the economy is already running at a reasonable clip, greater demand should result in higher prices. Second, the Federal Reserve may become worried about increasing inflation and decide to increase short-term interest rates. Moreover, governments will typically borrow more money to finance wider deficits, thus increasing the demand for debt. The price of debt, the interest rate, should then, in theory, go up. Should, ultimately, interest rates rise, economic growth will subsequently slow. Businesses will find it harder to finance their investments, and households will have to pay more for their debt for everything from credit cards to home mortgages. Higher interest rates could then dampen the positive effects of wider cyclical deficits as economic growth is slower than it would be otherwise. Again, the critical underlying question is for what purposes the deficits were used, especially whether the underlying investments promoted faster economic growth. In the context of an economic downturn, there are typically few worries about higher interest rates. First, faster inflation may in fact be desirable to some degree since it makes it easier for people and businesses, for example, to pay back their debt. It also makes it easier for the Fed to use its traditional tools of monetary policy to bring the economy to full employment. As a result, it is unlikely that the Fed will counter with higher interest rates. A recession, after all, goes along with slowing inflation and the possibility of deflation—declining prices—if the recession is severe enough. Monetary policymakers and economists worry about slowing inflation and deflation for several reasons. For one, less inflation and deflation make debt more expensive and hold back businesses and individuals from making major purchases. Businesses and households may also hold off spending their money in the present in the expectation that things will be substantially cheaper in the future. Reducing the chance of deflation by returning to more normal levels of inflation is thus desirable, and the Fed will not respond by raising interest rates. Second, a recession means that private market activity is slowing, possibly declining. Businesses will borrow less as a result, leaving more money to be lent to the government. In other words, the rising demand for government debt offsets the falling demand for private sector debt in the middle of a recession. All of this was precisely what occurred, at an extreme level, during the Great Recession leading to the extraordinarily low interest rates that followed. The bottom line is that wider cyclical deficits can have some positive effects on both short-term and long-term economic growth. Structural deficits by definition follow from policy decisions to either reduce taxes below the level necessary to fund existing and promised spending or to increase spending beyond the level of current and expected revenues. Alternatively, structural deficits could emerge because governments increase spending. Additional spending could go toward new infrastructure measures, higher education, and larger social programs. All three measures could, in theory, result in faster long-term growth. Infrastructure measures include better roads, fewer bottlenecks at harbors and airports, faster broadband service, and improved transit options, among a range of other capital investments. Such investments can immediately reduce the costs of operation for business, as it is easier to transport goods across the economy. Employees will also spend less time commuting due to this improved infrastructure, resulting in increased productivity. Finally, a better infrastructure can make it easier for people to innovate, for example, because they can more quickly communicate and collaborate with each other. Both lower business costs and more innovation make companies more productive. They can produce more with the same amount of inputs, boosting economic growth. In addition, more education can help reduce income inequality by providing long-term impacts on opportunities for employment.32 Less income inequality boosts economic demand, as it shifts money away from rich households who save instead of spend, allowing companies to more easily sell their products. It also means that households take on less debt, which stabilizes economies. And less inequality increases savings, so that people are better prepared for the future. They can more easily switch jobs when new and better-suited opportunities emerge; more easily start a business; and better support their children’s education—all mechanisms that help boost long-term growth. Investments in children go beyond formal education spending. Helping families get out of poverty through the Earned Income Tax Credit, for example, increases economic upward mobility for their children in the future.35 Medicaid can result in both better health and economic outcomes as young adults.36 Public spending can thus reduce future inequality through a number of mechanisms—not just more education spending. In addition, other recent research on the importance of reducing excessive inequality in the United States and other developed economies shows that public spending could contribute to faster economic growth over time.37 Key pathways from less inequality to faster growth include more widespread and better educational outcomes; stronger demand;38 and less debt and more savings,39 among others. The bottom line is that structural deficits’ effect on long-term economic growth depends on how and when the structural deficit comes about. More progressive taxation, for instance, could strengthen economic growth, mainly by reducing income inequality, whereas supply-side tax cuts have little to no impact. A range of spending initiatives such as more infrastructure, education, and social spending could boost long-term economic growth. These measures are especially effective when the economy still has some slack—it operates below its potential—as is currently the case with continued underemployment, modest business investment and comparatively slow economic growth, and very high income inequality. There is ample evidence indicating that structural deficits result in higher real interest rates over time. The empirical evidence, though, differs on the size of this effect. Table A-1 in the appendix summarizes the findings of several key studies as well as the underlying data and methodology. At the low end of the estimates, Eric Engen, economist with the Federal Reserve Board, and Glenn Hubbard, dean of the Columbia University Graduate School of Business, find that long-term interest rates increase by 3 basis points, or 0.03 percentage points, if the debt-to-GDP ratio goes up by 1 percentage point.41 In comparison, William Gale, economist at the Brookings Institution, and Peter Orszag, former director of the Office of Management and Budget, find that an additional percentage point in deficits relative to GDP, which is close to a 1 percentage-point increase in the debt-to-GDP ratio, raises long-term rates between 40 basis points and 70 points if higher deficits reflect a sustained increase, and not just a temporary change, in deficits.42 Thomas Laubach, an economist at Goethe University in Frankfurt, Germany, estimates that a 1 percentage-point increase in the deficit relative to GDP, as projected by the Congressional Budget Office (CBO), will raise interest rates by 25 basis points.43 Whether these findings hold in the current environment is another question, as many of these studies were conducted before the Great Recession. After all, the United States has maintained very low interest rates, even as structural deficits increased. That is, the effect of structural deficits on interest rates appears to be relatively small. Small increases in interest rates will have little offsetting effect on economic growth.44 The main issue then is whether structural deficits will boost economic growth and by how much. Overall, well-designed spending plans, such as infrastructure investments, can have large multiplier effects.45 These would likely offset any effects of higher interest rates,46 especially in an environment characterized by both persistent underemployment and unemployment, as well as low interest rates.47 The growth effects of such well-designed spending measures will dwarf negative interest rate effects from more debt. Most relevant to this argument, Olivier Blanchard, senior fellow at the Peterson Institute for International Economics and former chief economist for the IMF, argued that interest rates typically remain below the economy’s long-term expansion path, posing no challenge to rolling over public debt.48 In other words, using structural deficits to finance faster growth poses no public finance burden. Again, the main concern then is whether governments use their deficit spending most efficiently to boost economic growth in the fastest way possible, based on the existing evidence. Widening trade deficits could pose another offsetting outcome to the growth effects of structural deficits. Wider trade deficits can adversely affect economic growth to the extent that they reduce industrial capacity at the technological frontier, which means that productivity growth ends up being lower because of the wider trade deficit.51 Debt relative to the size of the economy could then grow faster than would be the case without this adverse effect. Trade deficits can also contribute to growing inequality, as some workers lose out from competing with low-cost imports, while others are protected and possibly gain from more global trade. As a result, trade deficits could exacerbate the economic gulf between certain regions and further weaken economic growth. Some economists assert that budget deficits in fact contribute to wider trade deficits on the grounds that higher interest rates raise the value of the dollar by attracting more money from overseas into the United States, thus making U.S. exports less competitive and imports relatively less expensive.52 This argument is known as the “twin deficits,” as it links budget deficits to trade deficits.53 The United States has indeed simultaneously experienced budget and trade deficits, but the twin deficits theory does not always appear to be borne out empirically when examined over time. Trade deficits have widened when budget deficits fell; trade deficits have shrunk when budget deficits widened. The link between budget deficits and trade deficits is broken, because a wide variety of factors other than the U.S. government needing to borrow money determine trade deficits.54 These factors include domestic savings by individuals; the availability of money around the world to be invested in the United States as a safe haven for such investments; labor and environmental conditions in other countries; and intellectual property protections, among others. These factors determine the trade and capital flows and thus the exchange rate, which can weaken or strengthen the effects of budget deficits. That is, budget and trade deficits can simultaneously occur, but they are not necessarily correlated. The discussion of the possible growth and interest rate effects of structural deficits depends on the timing of the deficits. Generally, policies will have more of a positive growth effect and result in smaller interest rate increases when the economy is still operating under capacity with high unemployment. The closer the economy is to full employment, the more likely it is that new deficits will boost inflation and, depending on monetary policymakers’ tolerance for faster wage growth, force faster actions by the Fed to tighten monetary policy. Relatedly, policymakers will need to think about finding some additional revenue in the future; tax cuts do not pay for themselves. In one rather optimistic estimate, Greg Mankiw, President George W. Bush’s head of the Council of Economic Advisers, and Matthew Weinzierl estimate that tax cuts recoup only between 15 percent and 32 percent of their initial costs through faster growth.55 Similarly, estimates of the dynamic effects of the Tax Cuts and Jobs Act of 2017 show that, on average, faster growth will only cover less than 20 percent of the costs of the tax cuts.56 That is, supply-side tax cuts have little offsetting effects in terms of faster economic growth, even when making overly optimistic assumptions about their positive impact. Other fiscal policy measures, such as infrastructure spending and efforts to reduce income inequality and increase income mobility, will likely have larger offsetting effects, as all of the evidence on their economic impact reviewed in this report suggests. But dynamic scoring rules that combine current expenditures such as lower taxes with future estimated benefits largely apply to mandatory spending and revenue. These rules then create an inherent bias toward tax cuts relative to spending increases.57 McGraw Hill Financial—now S&P Global—the Progressive Policy Institute, and the American Action Forum estimated an example: An infrastructure spending increase of $100 billion could generate $62 billion to $165.5 billion in additional output over a 20-year window.58 The CBO and IMF estimate infrastructure spending multipliers fall between 1.3 and 1.4, but research suggests that the macroeconomic environment could skew these numbers.59 However, it is unclear on whether the resulting faster growth will be enough to maintain a stable debt-to-GDP ratio without more revenue. Congress then will need to consider ways to generate more revenue or reduce spending when long-term growth has accelerated. On net, structural deficits can positively contribute to long-term growth under specific circumstances. Policies that increase infrastructure investments and education as well as those that lower income inequality can have positive effects on long-term growth. Some factors, such as higher interest rates, will play a small offsetting role when the economy still faces underemployment. Other factors, such as higher trade deficits, will not slow economic growth when following wider deficits. As the economy nears full employment, Congress will need to identify ways to raise more revenue or lower spending to avoid unsustainable debt levels. One key question then is what level of debt is sustainable for the United States.63 As the authors discuss below, the United States currently has significant fiscal capacity. For most countries,64 high and rising debt levels traditionally raise three concerns. First, high and rising debt levels relative to the size of the economy and its growth rate could result in sharply less economic growth as—depending on the underlying economic circumstances—investors factor in potential increases in interest rates and concomitant slowdown in the economy that would arise. Worse, investors who finance existing deficits and help a country refinance its debt on a regular basis may feel that the debt requires more in additional tax revenue or spending cuts than is politically feasible. This could happen for a number of reasons. One example would be if interest rates rise due to factors that may be out of a government’s control. Any economic slowdown that arises from higher interest rates would worsen the debt repayment burden, potentially accelerating the path to a debt crisis. Such an economic slowdown after all would also make it harder to raise revenues or cut spending to finance deficits. Second, a high level of debt burden when entering a recession could make policymakers reluctant to aggressively respond with new spending or lower taxes for political reasons, not necessarily economic ones. But without robust countercyclical policies, especially when there is room to temporarily increase deficits, economies could experience deeper or longer recessions. Worse, a recession means that the debt-to-GDP ratio may rise, potentially leading policymakers—absent assistance from the IMF or other central bank-like authority—to enact austerity measures that would affirmatively worsen or prolong the economic downturn. Third, high levels of debt may limit desirable policy options, even during nonrecessionary times. Under ordinary circumstances, a high debt level also means relatively higher interest payments. Such interest payments then, under the same level of taxation, crowd out other desirable public spending. Depending on the underlying reasons for the high debt levels, policymakers may still want to utilize deficit spending to foster faster economic growth and more income equality. Yet, their ability to do so may be limited due to high interest payments. The basic economic concerns on the link among debt, interest rates, and growth result in the analysis of three separate questions. First, is there a debt level above which the chance of higher interest rates and slower growth systematically increases? There is no clear consensus in the literature on this. Some researchers argue that high debt levels result in a crisis,65 while others take the opposite position and argue that slower growth leads to excessive debt levels relative to GDP.66 Yet, others suggest that it may not be debt levels, but rather the trajectory of debt, that ultimately matters for growth.67 Overall, the link between debt and growth is contested, possibly because many countries under investigation have not systematically reached excessively high levels of debt.68 Moreover, econometric techniques appear so far to be insufficient to establish a firm causality between debt and growth, even when there is evidence of a possibly negative link. The lack of consensus is true for most ordinary economies; as the authors note below, the United States has even more unusual features. But how high could debt reasonably go? The OECD, for instance, writes in a policy note a debt limit for developed countries around 200 percent of GDP.69 Beyond this limit, a government would no longer be able to roll over its debt and potentially face an economic and financial crisis. This debt threshold, though, needs to be seen in the context of the OECD’s own writings and experiences. In a related policy paper, OECD researchers write that the debt threshold beyond which there may be potentially negative growth effects lies somewhere around 70 percent to 90 percent of GDP.70 But they also caution that the causality between debt and growth likely runs both ways. In other words, it is unclear which matters more: whether debt is causing growth to slow, or whether slower growth leads to higher deficits and debt.71 Averting a crisis scenario then could mean focusing on faster growth rather than on reducing debt. Second, is the United States different or even unique, allowing it to incur more debt than other countries? Possible adverse outcomes related to debt after all depend on a country’s ability to finance new deficits and refinance existing debt. The U.S. dollar, though, is the only global reserve currency, which makes it easier for the U.S. government to finance its debt than is the case for other countries. 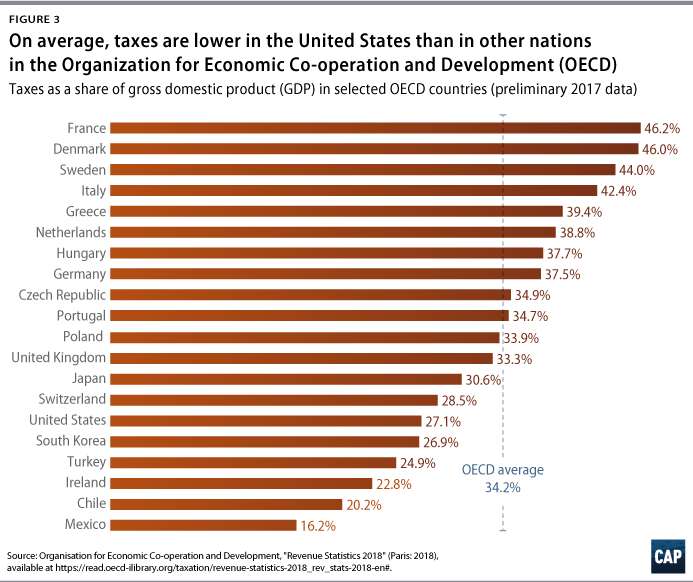 Moreover, the United States remains both a highly productive economy and one that collects overall fewer taxes relative to the size of the economy than is the case in almost all other wealthy countries.73 (see Figure 3)74 These factors leave it much more room to raise revenue to manage its debt levels. The debt thresholds for slower growth and economic crises, if they indeed exist, may ultimately be higher for the United States than for other developed economies. The main concern for the United States at this point is the relationship of debt to economically efficient investments that substantially bolster long-term growth. For example, the massive tax cuts in 2017 will likely contribute little to long-term economic growth but substantially expand deficits for years to come, with affirmatively negative social benefit in that the cuts increased inequality and facilitated further concentration of economic power.75 Other large recent debt increases come from the fallout from the financial crisis and Great Recession, the wars in Iraq and Afghanistan, and earlier rounds of tax cuts in 2001 and 2003. During the financial crisis, for instance, the debt-to-GDP ratio jumped from 35.2 percent in 2007 to 52.3 percent in 2009. (see Figure 2) That is, the United States has moderate levels of debt compared with other countries, but it has an upward trajectory of debt deployed for questionable value. This is especially concerning given the large levels of existing or foreseeable economic risks, such as climate change; the retirement crisis; and growing inequalities by race, ethnicity, gender, and geography, among others. In short, while the United States has significant fiscal capacity, it does not have capacity to waste. Third, does debt cause slow growth? As the authors already discussed before, the economic evidence on the causality between debt and growth is mixed. Some studies find that high debt levels precede an economic slowdown.76 Others, though, find that typically slower economic growth precedes high debt levels and greater economic risks Much of the economic research on sustainable debt levels focuses on measuring threshold levels of debt. This is consistent with the view that debt causes slow growth. But, as mentioned above, it is possible that a country’s slowdown in growth—for instance, precipitated by higher global interest rates and oil prices, among other factors—first leads to an increase in the debt-to-GDP ratio. This could then set off a vicious cycle of even higher debt levels and even slower growth. The policy implication here is that deficits that increase debt but also increase the chance of faster growth—such as increased spending on infrastructure and education—lead to debt levels that are more sustainable over time than deficits that do not enhance long-term growth prospects. Of course, it is possible that the causality runs in both directions. In any event, as the literature does not offer a clear answer on the causality between debt and growth, policymakers need to focus on fostering faster growth while keeping deficits manageable. 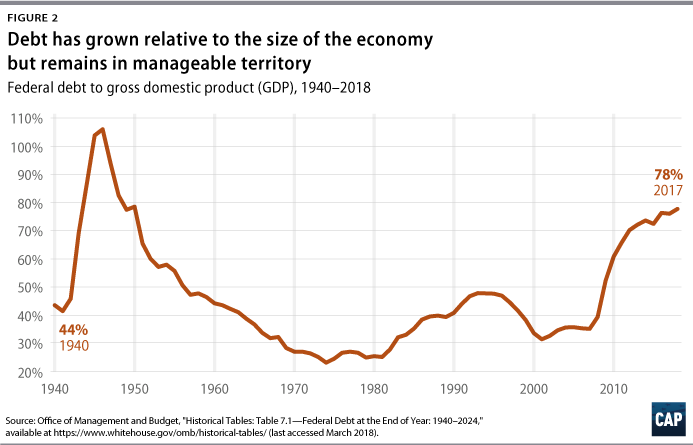 In the context of the United States, the literature further suggests that Congress and the administration have sufficient room for expansionary fiscal policy in the coming years, assuming it is efficiently designed to maximize its growth effect. The review of the economic evidence on deficits, debt, and growth can help inform policy design in the future. The evidence indicates that tax and spending policies determine the long-term consequences of deficits and debt. Ill-designed policies, especially supply-side tax cuts, add to the deficit and to the federal debt without any noticeable offsetting benefits. The result of these riskier economic policies are faster increases in the debt-to-GDP ratio, which could at some point put enough of a burden on economic growth to cause a substantial slowdown. In comparison, infrastructure and education spending as well as progressive social insurance expansions can have meaningful long-term growth effects. This distinction further implies that Congress and the administration can choose to either pursue sustainable policies that enhance economic prosperity or advance policies that heighten economic risks. The evidence indicates that the United States is still some time away from such unsustainable debt levels, leaving Congress and the administration sufficient room to change course in a considered and responsible manner. Using fiscal policy in an efficient and effective way can help to boost economic growth and reduce economic inequality, while also helping to stabilize the economy during inevitable fluctuations. Congress and the administration can then create the pathway forward for a broad, strong middle class that will see meaningful upward mobility, instead of the current approach of handing the most money to the luckiest few. Christian E. Weller is a senior fellow at the Center for American Progress and a professor of public policy in the McCormack Graduate School of Policy and Global Studies at the University of Massachusetts Boston. Sara Estep is a research assistant for Economic Policy at the Center. Galen Hendricks is a special assistant for Economic Policy at the Center. The authors are grateful to Dean Baker and Bill Gale for insightful and helpful comments on earlier drafts. All errors and omissions are solely the authors’ responsibility. Debt held by the public is the result of past deficits that have been financed by issuing government bonds and selling them to domestic and international investors. This debt is held by foreign governments, institutional investors such as pension funds, and individual investors, for instance, in retirement accounts. The federal government pays interest on this debt. Since this debt is fully marketable, most studies tend to use this debt for their analyses.78 Many theoretically adverse effects of debt on economic growth after all depend on financial market reactions to that debt. But occasionally, reports show that the U.S. government owes more debt than that. Part of its past shortfall in general revenue has been financed by surpluses from Social Security and Medicare, among other, smaller programs. Importantly, Social Security and Medicare collected more payroll taxes than they paid out in benefits for much of the past four decades. These programs then reduced the total deficits and invested their surpluses in government bonds, building up their trust funds. The U.S. Department of the Treasury pays interest on this debt to Social Security and Medicare. The U.S. government is already repaying some of this debt for Medicare, for instance. But this is just saying that the federal government is paying part of these programs out of general revenues when payroll taxes fall short of benefit payments. By the same logic, governments and economists calculate the implicit debt that governments incur, typically through retirement and health insurance programs. Accounting standards often require governments to report these implicit debts, often called unfunded liabilities, and ratings agencies respond to such unfunded liabilities in their assessment of government finances. Importantly, these valuations mainly economically affect state and local governments, rather than the federal government. Social Security and Medicare annually report their implicit debt over the next 75 years, but the economic effect of these debts is limited. There are several reasons for the differential effect of this implicit debt on state and local governments compared with federal governments. The unfunded liabilities of state and local governments often come due much sooner than is the case for the implicit liabilities of Social Security and Medicare—the money these programs owe in the future beyond what is covered by the trust funds and future payroll tax payments. Because much of the future debt of Social Security and Medicare comes from expected deficits decades into the future, there is tremendous uncertainty over the actual levels of future debt since economic and policy changes can raise or reduce this debt. Moreover, state and local governments often by law or de facto operate under severe financial constraints, such as balanced budget amendments. They will feel the economic impact of paying off this debt more immediately and directly than is the case for the federal government, which can more easily borrow to finance deficits.